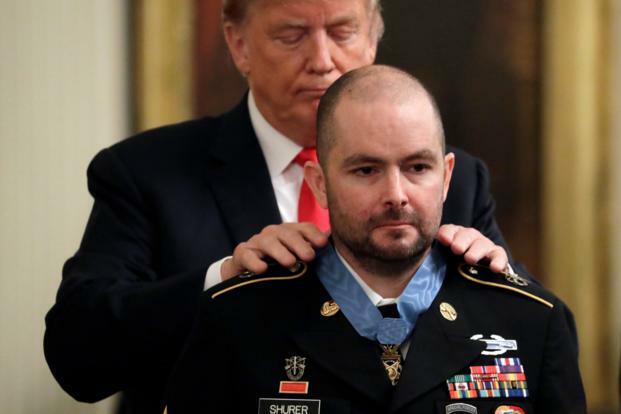 President Trump puts the Congressional Medal of Honor around the neck of retired Staff Sergeant Ronald Shurer, a Washington native. President Trump today [Monday] awarded the Medal of Honor to a Washington Army medic who saved the lives of several colleagues during a firefight in Afghanistan in 2008. The president placed the medallion around the neck of Staff Sergeant Ronald Shurer during a ceremony in the White House this afternoon. Shurer and other members of his Special Forces team were on a mission in a remote Afghan village when they came under enemy fire. Shurer treated one of his soldiers at the base of a mountain, then climbed to where the rest of his comrades were fighting. He treated four others and helped to get the wounded Americans to where they could be transported to hospitals. Then he joined the others in the fight until the battle ended several hours later. Shurer graduated from high school in Puyallup and college at Washington State University. He enlisted in the Army in 2002 while in Spokane. He was discharged from the Army in 2009 and now works with the Secret Service in Virginia.